A pretty interesting story gets bogged down in it’s second half by a little too long a film and too slow a pace. The first thing to know about the new version of Les Miserable’s starring Anne Hathaway, Hugh Jack man, and Russell Crowe, is that every single line of dialogue is sung. There isn’t one full sentence and barely even a word that is not part of a song or spoken to another character through music. It’s kind of ridiculous when you think about it, that even the slightest remarks end up being sung and not spoken. And yet it is to the movie’s testament that this is not really a problem, and that the film is able to make us forget about that and accept it for what it is. Les Miss would have been a far greater movie if it were just a little shorter. Ok, maybe a lot shorter. The film comes in at two hours and forty minutes, and any film that asks it’s audience to sit still and keep focused for that amount of time better have a good reason for being so long. Les Miss does not. In fact, it even adds songs to the Broadway musical. Now, I could understand if it was adding songs because they were part of action scenes that helped spice the movie up and add excitement, but this is not the case. Adding to a movie that is already long is always a bad idea. The reason why the movie’s great length being the main problem is so apparent and clear is because the first half of the film is pretty great. It opens on the docks with Hugh Jack man’s character, Jean Valjean, helping raise a ship out of the water. This scene is shot fantastically with rain pouring down on the men as they work and sing, and Russell Crowe standing over them giving orders. He plays inspector Javert, one of the villains of the film. From here, we meet Anne Hathaway’s character, fantine. She is a poor girl working in a factory. Jean Valjean has transformed himself, stealing the identity of a man who was of great wealth. Now Valjean poses as the owner of the factory where fantine works. When it is discovered that fantine has a small child at home, she is quickly fired from her job and sent to the streets. Valjean, who felt that he was also persecuted when he was arrested, now tries to help her. Only he is too late. She becomes terribly sick from the poor conditions all around her, and meets her death. The first half is not only about the fantine character and Valjean trying to help her, but also about Valjean’s escapes from inspector Javert. The inspector recognizes Valjean as the prisoner who he once knew working on the docks, and is certain he is right until Valjean finds a way to prove that he is actually this wealthy merchant. And now Javert feels like a fool and begs Valjean to accept his apology. All of this happens in the first half. It is a long half, filled with ups and downs, but mostly it is entertaining and fun. That’s because the actors are really top notch and do a nice job with this work. All three of our leads are major parts of this first half and do a wonderful job bringing the story to life. But then something happens. The movie hits the halfway point, and while it feels like maybe it should be nearing its end, it instead starts introducing new characters. This would be okay if those new characters were just side players, but instead, they actually become the new stars of the film. It is pretty late in the movie to be changing who the stars are and adding new protagonists. Anne Hathaway’s character from the first half is basically replaced by Amanda Seyfried’s character, Cosette, in the second half. Cosette is Fantine’s daughter, no longer and child and now grown into a young woman. there are some fun scenes with her as a little girl, working in a brothel as someone who sweeps the floors, but by the time they are over and Cosette is grown, we are not ready for a whole new storyline. only that’s what the movie gives us. We are now treated to a love story between Cosette and a young man, named Marius. There is humor in the movie, mostly in the form of Sacra Baron Cohen adding to whichever scenes he is in. Cohen plays the master of the house, the head master who runs the brother alongside his partner, played by Helen Bonham Carter. Cohen basically does the same thing that he did for the Tim Burton film Sweeney Todd (which also starred Bonham Carter.) he adds humor to his scenes, but his scenes are really just a side part of the film, and not really the focus of the story. 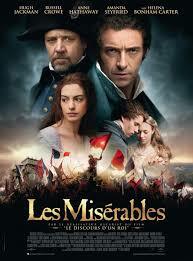 Les miserable’s has plenty of good features, including some fantastic songs, but it is just too long of a film. The movie doesn’t seem to care about its audience, (just like Lincoln, which is also in theaters.) How else to explain the adding of songs at the expense of the viewer’s patience? Both Les Miserable’s and Lincoln are best picture contenders with Oscar nominations in that category and many others, and at least with this movie, the first half was great. Lincoln was a much more frustrating film. Les Miserable’s is good, but it’s second half sure does wear the viewer out.